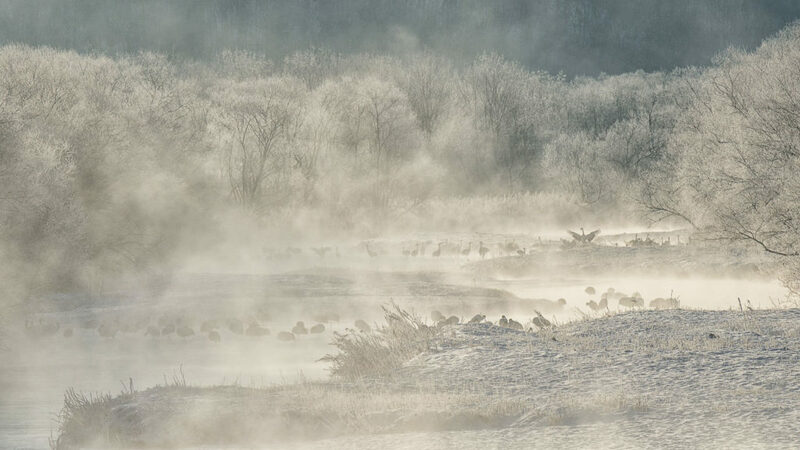 On a foggy morning, when the temperature is down to minus 20 Celsius degrees, the first rays of sun are awakening a group of red crowned cranes. One of them opens the wings to warm up from the freezing temperature of the night. Manchurian Cranes play an important role in Japanese cultural tradition. They carry plenty of symbols, legends and tales. It is said that a Manchurian Crane may live over one thousand years; moreover the couple is together for life. This is why longevity, health, prosperity and faithfulness are the most recurring attributes associated to cranes, which often appear as good omen in occasion of Japanese weddings and New Year’s Eves.